Care's pace and invention have made him one of the most dangerous operators in world rugby and he has been a regular on the international stage since making his breakthrough in 2008. He began his professional career with Leeds in 2004, serving as understudy to All Blacks great Justin Marshall. He featured for the Tykes whilst also starring for England Sevens at the 2004 Commonwealth Games and also on the IRB Sevens circuit. At the start of the 2005-06 season Care left Leeds and signed a contract with Harlequins and was subsequently granted a run in the Quins first team while both Andy Gomarsall and Steve So'oialo were competing at the 2007 Rugby World Cup. He continued his fine form into the early months of 2008 and as a result he was called in to the England squad for Six Nations games against Ireland and Scotland but did not make it into the match day squads. However, his form at domestic level won him another chance to impress against the Barbarians at Twickenham in May 2008 that was followed by his first Test cap against New Zealand in June. He was selected for all of England's autumn internationals later that year and was named in the squad for the 2009 Six Nations only to be ruled out of England's opening two games due to a twisted ankle. Care's first appearance in the Championship will not be fondly remembered, as he was sin-binned for barging Ireland prop Marcus Horan at a ruck having come on as a second-half replacement, effectively losing the game for England. The 2010 Six Nations began in a far more positive fashion for Care, who scored a solo try against Wales in England's opening victory after reclaiming the starting jersey from Paul Hodgson. In 2010-11, however, Care found himself behind Leicester Tigers' scrum-half Ben Youngs in the battle for the England No.9 shirt. Youngs started all five of the 2011 Six Nations games, though Care still managed to make an impact crossing the line against Italy. Care marked a successful club season with Harlequins by lifting the Amlin Challenge Cup before being named in Martin Johnson's 45-man training squad ahead of the 2011 Rugby World Cup. After impressing in England's two warm-up Tests against Wales, Care looked set for a place on the plane to New Zealand. However, he suffered a broken toe on the eve of the tournament that sadly ruled him out of the equation. 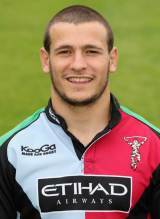 Care swiftly found his best form on his return to Premiership action and played a key role in Quins' flying start to the 2011-12 campaign. A return to England colours for the 2012 Six Nations looked likely before two alcohol-related incidents saw him cast aside by interim head coach Stuart Lancaster. Care was fined a "substantial" amount by Harlequins following his arrest for being drunk and disorderly in the wake of his side's Heineken Cup defeat to Toulouse in December 2011 and a drink-driving charge three weeks later saw him dropped from England's Six Nations plans. Lancaster declared that Care would not be considered for selection again until he could be "trusted" and the scrum-half was later fined and banned from driving for 16 months. There would be more drink-related woe for Care just a few weeks later with his third arrest and caution in as many months - this time by British Transport Police having been caught urinating against a building following a night out in Leeds. Following a period away from the international game, due to his off-field indiscretions, Care returned for England's tour of South Africa in the summer of 2012. His strong form continued into the next season as he puts huge pressure on scrum-half rival Ben Youngs during the autumn internationals and 2013 Six Nations.